Most of the automobiles manufactured during the 20th Century used tubing in some form for various purposes. Fuel lines, vacuum lines, oil lines, and even water lines may have been fabricated using copper, brass, steel, or aluminum tubing. During a car restoration project, you can expect to have to replace or even fabricate from scratch a line made of metal tubing. 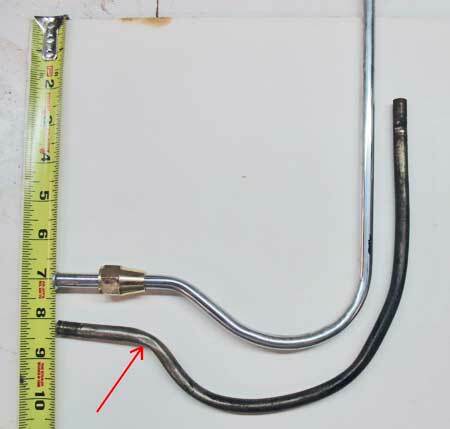 In this article we look at fabricating three custom bent tubing lines for an oil filter, a fuel line and water line for a firewall heater. Fabricating tubing lines follows three parameters, the Length of a segment, the Bend Angle, and the Rotation Angle (if any) as shown in Figure 1. Keep these three in mind as you read the article and view the photos. In the case of the existing oil line (Photo 1), the shape and orientation did not seem right, and an inspection of the existing oil line showed portions that were not straight and one section was worn thin (Photo 2). It most certainly would have burst under pressure, so a complete new fabrication was required. 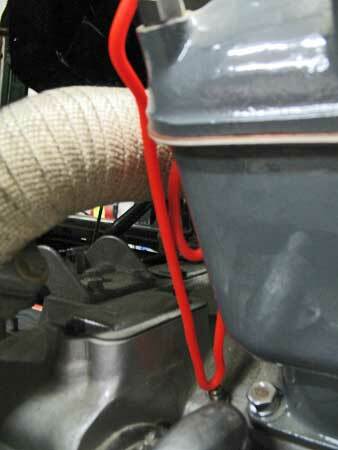 The fuel line was also fabricated using an existing pattern, however the water line was a new fabrication. Figure 1 — Graphic showing the three tubing parameters: 1) Length (of a segment), 2) Bend Angle, and 3) Rotation Angle. Segment Lengths (L) and Bend Angles are straight forward, but in some instances the tubing is rotated making the next bend. Photo 1 — This length of original copper tubing was examined and found to have a one inch long scrape almost as deep as the thickness of the tubing's wall. Clearly this length of tubing rubbed against something during its life, causing a worn spot on the side of the line. No doubt that under pressure, this tubing would have burst apart. Photo 2 — Close-up view of the worn section. This length of tubing cannot be trusted and is not worth repairing. Our inspection of the original oil line showed that it had been modified sometime during its life, so its shape could not be used for an accurate pattern. So a new pattern had to be made. Bending tubing into nearly exact angles and at specific locations can be complicated enough; having a good pattern is essential. Solid copper wire could have been used to create our pattern, however this reusable rubber Twist Tie calledGear Tie (Photo 3) was an even better choice. They are readily available in hardware stores. 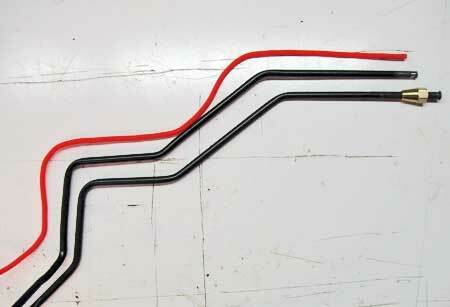 Originally designed to organize electric extension cords, using it as a tubing pattern worked well. Photo 3 — Side view of the oil filter mounted against the firewall where this oil line must be connected. The 5/16 flare fitting is at the bottom of the filter and is a important consideration in making this tubing line. Note the orientation between the oil filter and the engine's head. The tubing as it descends from the fitting has to be offset (bent) towards the firewall and then straighten downward before the bend to the flare fitting on the crankcase. 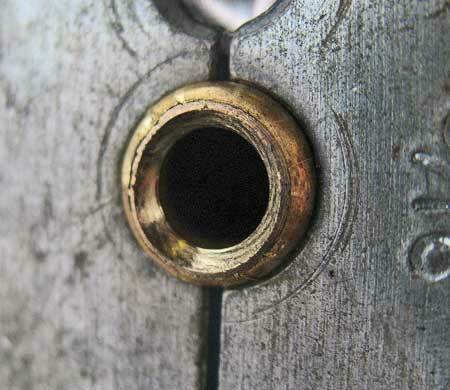 A first step in making this oil line is establishing the route the line will take between fittings. It has to travel around the engine's head, near the firewall and close to the exhaust manifold, and finally bend its way towards the crankcase. Photo 3 shows this path and the small space available for routing the oil line. 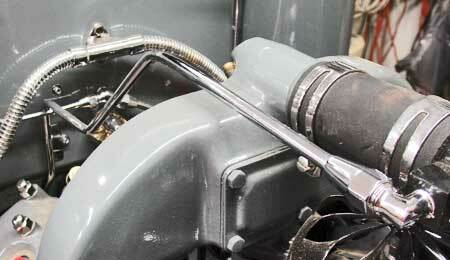 The flare fitting under the oil filter is our starting point. This permits a length of about two inches before we come to the offset needed to clear the engine head. As the GearTie is much longer than needed and we didn't particularly want to cut it, the excess was rolled onto itself and a bend was placed where it could be wedged into place, keeping the access out of the way while adjustments were made (Photo 4). Photos 5-8 show the GearTie pattern bent into shape and placed against the brass tubing to layout the bends. Photo 4 — As with most projects where there is some uncertainty, making a pattern helps the fabricator by offering a visual guide that replicates the desired part. In this case a reusable rubber Twist Tie from GearTie (stiff flexible rubber coated wire) was found at the local hardware store. They are intended to wrap electric extension cords, temporally hang things and many other uses. Its ability to be easily bent and retain its shape was the primary factor for using the GearTie for this pattern application and it worked exceptionally well. Note: The GearTie is rolled onto itself because it longer than needed. Photo 5 — The Gear Tie is laid down against the tubing and the bend marks are transferred. Photo 6 — The first segment in our tubing pattern is straight down and the offset was formed to route between the firewall, exhaust manifold (covered in high temperature woven wrap) and the engine's head. There are no rules about how much of a bend is needed. In general, gentle bends are easier to make and are encouraged. Every project has its constraints in its design. 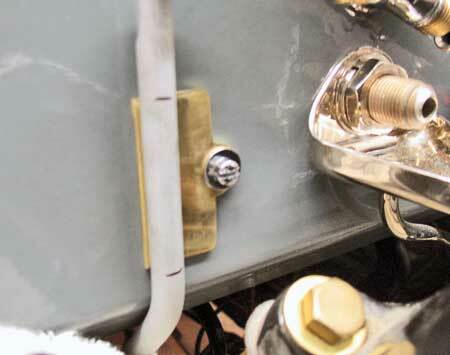 Note the reference line on the brass tubing to aid in keeping bends on the flat. Photo 7 — More bend marks are transferred to the brass line. Note that the reference line on the end has rotated. Photo 8 — Bends marks are again transferred to the brass tubing, this time with the tubing rotated to follow the pattern. Here are some things to consider when making the pattern: 1) angle of the bends, 2) location of the bends (from a starting point), and 3) angular reference where these bends occur (also referred to as Rotation Angle). In this case, the starting point is the fitting under the oil filter. Since we wanted our tube to remain flat, to avoid bending our tubing to some unwanted direction, we placed a reference line on the tube where it can be easily seen while fabricating the tubing (Photos 6 & 7). The first two bends (i.e. the offset to clear the head) are in line with each other so a reference line is made 90 degrees to the bends. 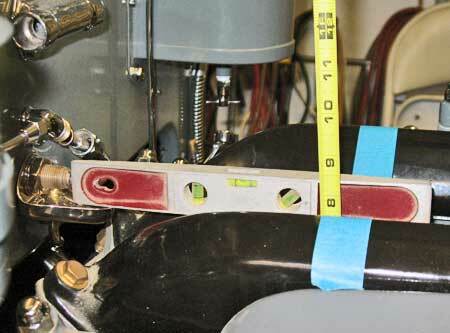 This oil line tubing project uses brass tubing from Restoration Supply Company. It is sold in eight foot lengths. While it is possible to cut an approximate total length of the tube and begin the flaring and bending steps, it makes more sense to work with the entire length of tubing, flaring one end first and making your bends from that point makes sense. Should something go wrong and you have to start over again, you want the piece of tubing to be as long as possible so that you don't come up short. Flaring — The composition of a double flare end is shown in Photos 9 & 10. The end is first widened to form the outside angle while the next step folds the tip into itself. The flaring tool set used is shown at Photo 11. 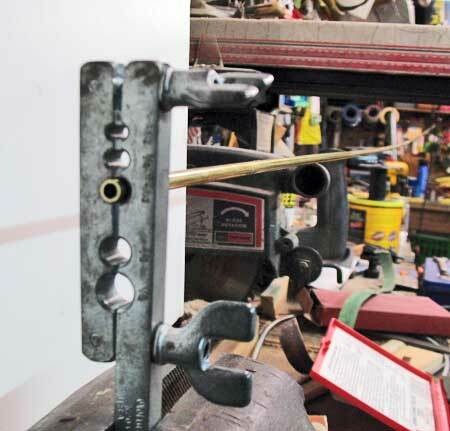 The tubing vise holder should be secured in your bench vise while the length of tubing is supported (Photo12). 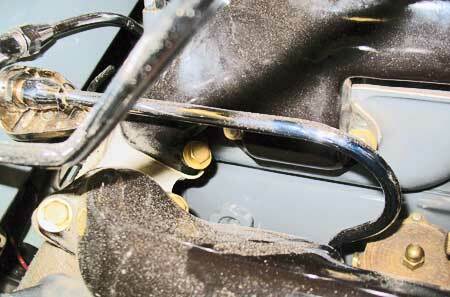 Photo 13 shows the tubing clamped into the holder with the appropriate amount of tubing protruding. Use the forming insert as a gauge for how much the tube must protrude. Using the cone vise and the forming insert, the tubing's end is drawn to full closure to make it into a shape of a bubble. Considerable force is required to create the bubble in the tubing. Employing an extension will make this task much easier (Photos 14-15). After the bubble has been formed (Photo 16) the insert is removed and the cone vise is again screwed onto the tubing to form the inside of the flare (Photo 17). The completed flare is at Photo 18. Photo 9 — Close-up side view of a double flare. 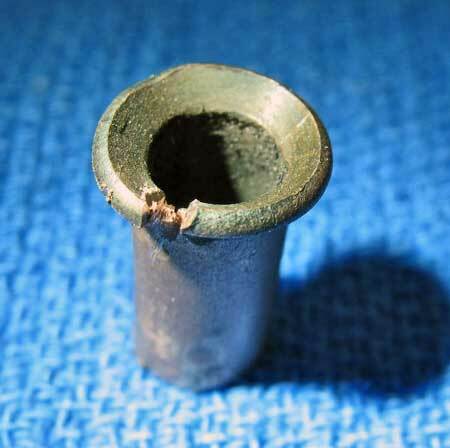 The cut into the flare's tip is another reason why this tubing could not be used. Photo 10 — Top down close-up view of the same double flare. Photo 11 — This Flare forming tool from Oldforge makes both single and double flare ends into the tubing ends. This set includes a multi size tubing holder (vise), different size forming inserts, and a cone shaped vise former. 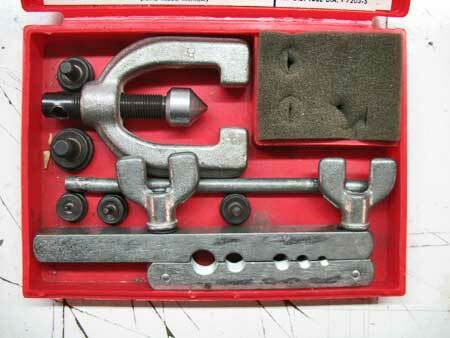 The Flaring kit shows the tubing vise which handles 3/16, 1/4, 5/16, 3/8 and 1/2 inch sizes. The five black disks with small dowels are the Flare formers for each of the sizes. The cone shaped vise former is used to set the inner flare when performing a double flare. 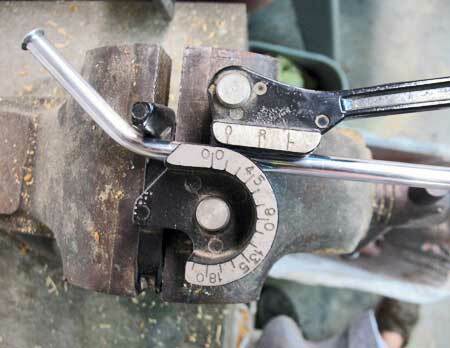 Photo 12 — The tubing vise is firmly held in the bench vise and the tubing is supported from kinking or bending. The tubing is locked in the tubing vise with some of the tubing protruding out the side. Photo 13 — Close up view of the tubing held in the tubing holder. Note it protrudes the holder by the thickness of the forming insert per the flaring tool instructions. Photo 14. 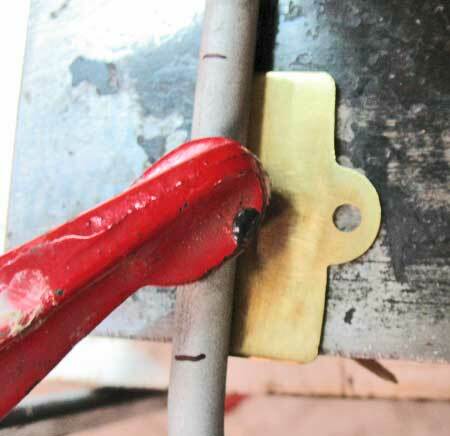 — The first flaring step is performed using the flaring insert with the forming dowel inserted into the tubing. 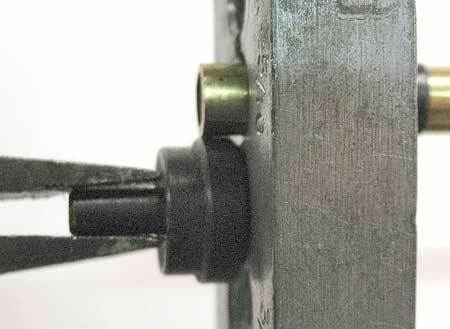 The Cone vise is locked down onto the flaring insert and compressed into the tubing. Extensive pressure is applied to form the flare ends with the help of an extension. 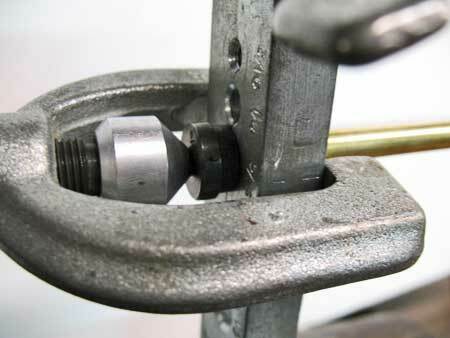 Photo 15 — The forming insert is seated against tubing vise to ensure the flare angle has fully formed. Photo 16 — Close up view of the "bubble" flare. Photo 17 — The cone vise is again employed this time without the forming insert. The cone will form the inside angle for the double flare. Photo 18 — Close up view of the completed double flare. 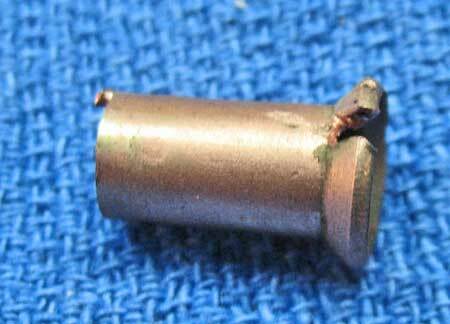 Flaring ends on tubing requires considerable force to make the required formed ends. 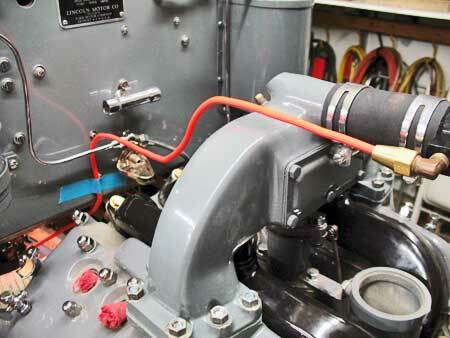 We have found that warming the tubing with a propane torch can make the task easier. You want to be sure the tubing is held tightly in the holder. Tubing not held tight can foul up the flare and may gouge the tubing (Photo 19) requiring you to start over, which will slightly shorten the length of the final tube). That is why it makes sense to flare one end before you make your bends in case you need to cut off the end and start over. Should the tube end up being gouged in the holder, if it is not too severe, you can use emery cloth to sand it smooth (Photo20). Also the nut itself may cover the area. A few wraps of tape around the clamping area of the tube is one technique that helps to minimize gouging (Photo 21). Photo 19 — An example of some gouging at the tip as a result of the tubing vise. In some cases the flare nut can cover this area which maybe acceptable. Photo 20 — If gouging occurred during the flaring process, emery cloth can sand the area smooth. 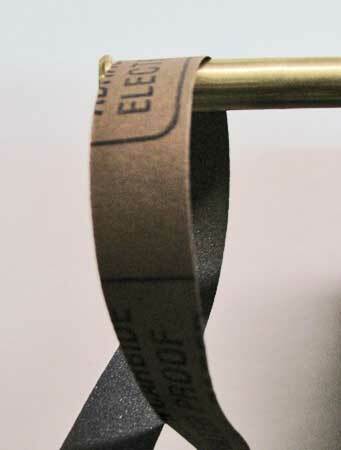 Photo 21 — A couple layers of tape wrapped around the tubing can help minimize gauging of the tubing surface. Bending — Several alternatives are available to bend your tubing depending on the radius of the bend desired. 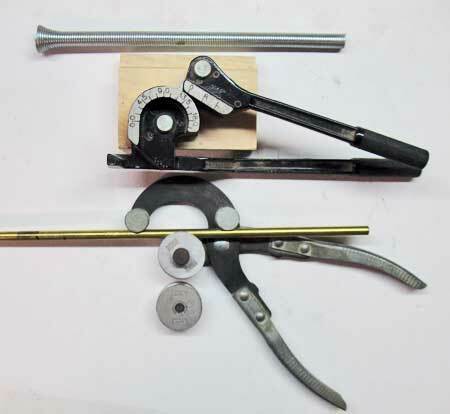 Photo 22 shows three different types of bending tools, each has their advantages. The spring bender can make graceful large radius curves while the other two are better suited for making sharper bends. 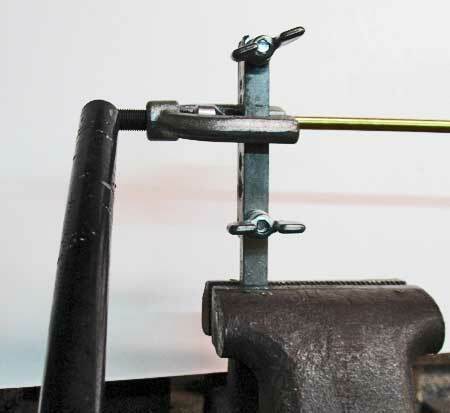 The black bender with the U-shaped bending anvil and grooved forming handle is the bender we used for all the bends shown in this article. The angle numbers on the edge, the forming handle and its ability to make slight bends to full sharp bends, and to control the rotation of the tube being bent are the reasons why it is favored (Photos 23 - 26). The completed oil line (back from the chrome plater) is shown at Photo 27. Photo 22 — Three different benders are shown, at top is a stiff spring, middle is a lever bender against grooved radius guides and below is a hand held former with two sets of radius wheels. 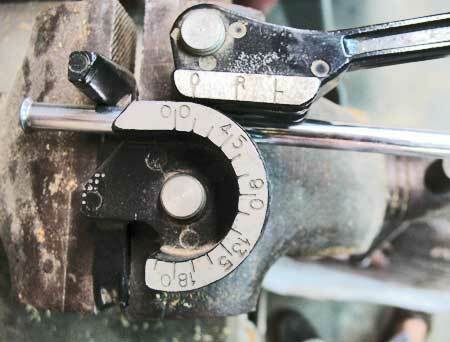 The middle bender is preferred by the author for its angular gauge. Photo 23 — The first bend in this oil line tubing. Note the edge of the tool on left which keeps the tubing from slipping around the tool's radius. Photo 24 — The reason for favoring this tubing bender product becomes clear where even slight bends can be formed to follow the pattern exactly. Photo 25 — Carefully align the markings on the bender's gauge and also note the angular marks you made for bends that are not on the flat. Expect to exert some force on the tool's handle and the tubing itself in makes bends. Move slow and steady to minimize kinks. Photo 26 — The tubing is repositioned for the offset bend. Can you spot the problem with this bend? 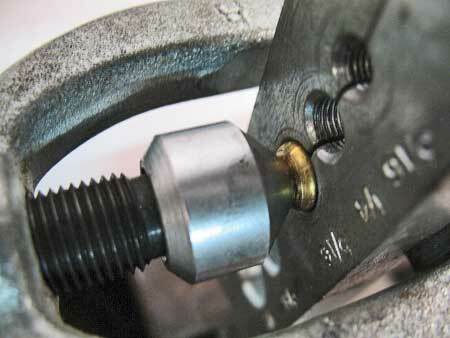 The flare nut was not put in place before the first bend was made. Photo 27 — The oil line tubing is returned from the chrome plater and fitted between the oil filter and the crankcase fitting. A perfect fabrication. The second tubing project is a fuel line between the firewall and the carburetor. It extends straight from the firewall, makes a hairpin curve around the exhaust manifold and curves back and down directly to the carburetor. 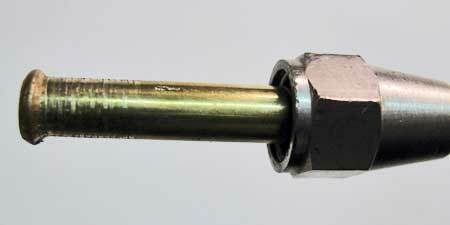 The original fuel tubing line had a significant gouge at a bend and could not be trusted. A complete fabrication was the safest solution (see Photos 28—30). Photo 28 — The second tubing project is a fuel line between the firewall and the carburetor. The area where the fuel line will be located is the between firewall flare fitting on the left and the carburetor (below the blue tape). The blue tape was put in place to make a temporary sling to rest the level. The measuring tape shows a rise of 8 inches (to center of fitting). While the first tape acts as a vertical guide, a second tape (not photographed) is used to measure the reach (from the firewall). 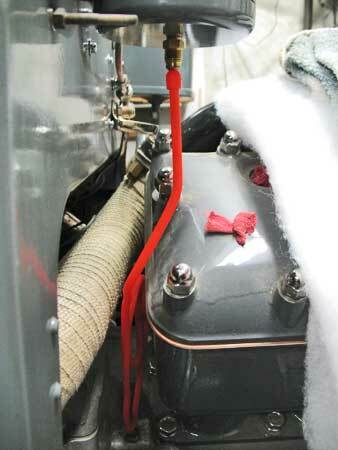 Photo 29 — The original fuel line shows the bad bend at the red arrow. It's used as a pattern for the dimensions from the firewall, the hairpin curve around the exhaust manifold and back/down to the carburetor. The tubing was laid out on foam core as a square guide. The 8 inch rise dimension was already measured on the foam core. The 7 inches shown on the measuring tape is the reach from the firewall. Photo 30 — The fuel line tubing is returned from the chrome plater and fitted between the firewall on left and the bronze carburetor. The third and final tubing project is a water line from the upper radiator hose to the heater with mounting to the firewall. This is a custom new installation where several routes could have been followed i.e. either over or under the intake manifold. The design planned to include a flat plate soldered on the line to utilize an existing firewall screw as a hard mounting point. Contrary to the advice given earlier, this tubing line started with the segment that will be hard mounted to the firewall and worked up to the radiator hose. Photo 32 shows comparisons of the pattern, the first attempt and the final version. Photos 33-35 provide details about this water line. Photo 31 — The Gear Tie is again used to make a pattern for a water tubing line. Since this is a new custom fabrication, several routes were considered when designing this water line. It was planned to include a thin plate to mount this tubing onto the firewall which dictated the high point and thus the overall route for this water line. Photo 32 — Side by side comparison of the orange water line pattern, the first attempt and the final version (shown with the flare nut). This tubing was made using steel tubing with that was purchased with a protective coating. The coating was removed before sending it to the plater. 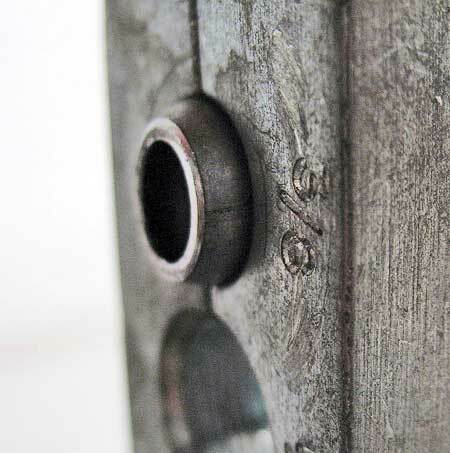 Since the vertical segment is hard mounted to the firewall, it is the starting point for all dimensions and angles. Can you spot the problem with the middle line? It's the kink on the left side, below the vertical segment. Photo 33 — Close up view of the brass flat plate before silver soldering to the tubing. Photo 34 — Fit check of the water line with the brass plate screwed in place where it will be silver soldered to the water line. Photo 35 — The completed water line is returned from the chrome plater and installed. The design, bends and fit checks along the way paid off. Flaring connections require special tubing nuts be used. These are available in short or long lengths. The long length nuts can cover any tool marks while the shorter one can better accommodate bends immediately after the flare. 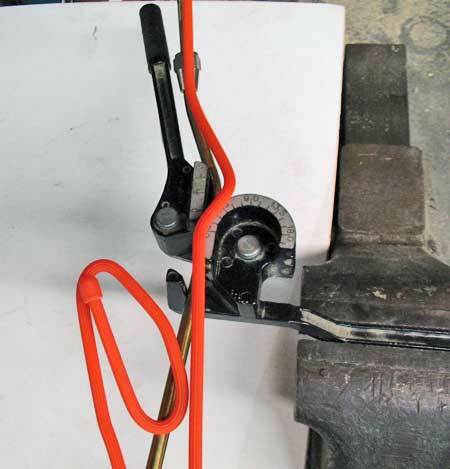 A flaring tool vise may leave marks in tubing while flaring the ends. One to two wraps of vinyl tape at the end may help minimize those marks. 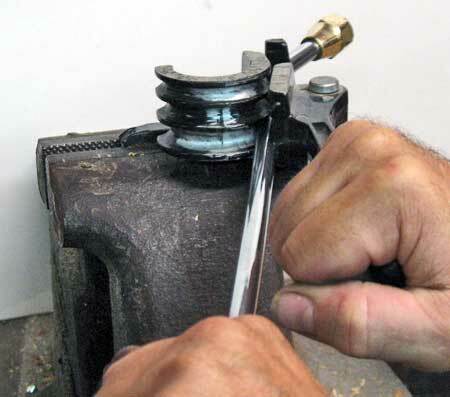 You have the choice of making your bends first and then flaring the ends or vice versa. Every tubing project has its unique bending challenges. Some maybe better started in the middle and work out and some starting at one end and bending to the other end. Perform fit checks often as you go. Tubing cutters and flaring tools are available at most auto supply stores.